1. 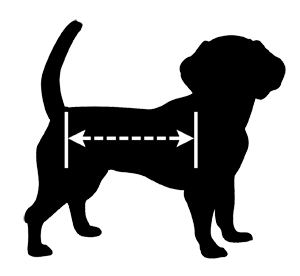 Length: Measure your pet from the base of his neck to the base of his tail as shown in the illustration. 2. Always round up to the next larger size if your measurements meet or exceed the maximum measurement (or range of measurements) in the smaller size. PLEASE round up to the next larger size if your pet has a thick coat, broad chest, or wide underside. When in doubt, order the larger size.